So that the user will know this is all part of the website experience, a simple countdown timer is shown letting them see how much time is left before the page changes. There's even a secondary option in the script that allows for a short one-liner to be displayed during the eventual redirect, though the transition is typically too quick for anyone to read (so it isn't mandatory, if left blank it will default to say "Redirecting... "). * Copyright (C) 2006-2009, QuietAffiliate.com. All rights reserved. * YOU DO NOT REMOVE THIS MESSAGE. There you go! 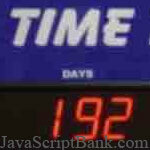 You can change how the countdown timer looks via CSS. This is the most basic example of how you can use this script but hopefully it saves you some time/gives you some ideas.